This recipe doesn`t involve any actual pumpkin though. Those recipes will come really really soon though! I just wanted to come up with an idea to utilize the Halloween and Fall theme, but make a super simple recipe to involve kids in the project for those parents looking for a fun activity for their children. I`m not sure if you are aware, but you can totally make your own tortilla chips using flour tortillas. Plus, it`s easy. You just cut them into your desired size, brush with oil, sprinkle some salt, and bake! 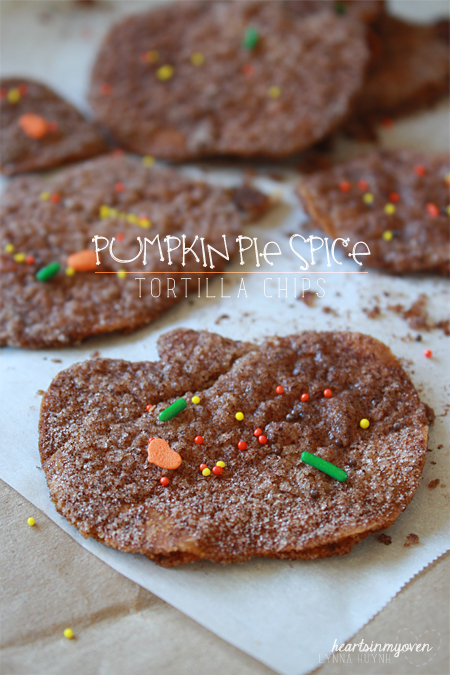 Instead of making the savory kind of tortilla chips, I thought it would be a fun idea to use pumpkin pie spice to get into the Halloween spirit! 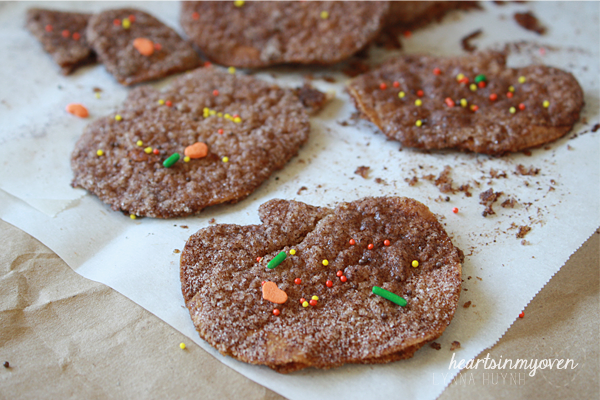 These taste similar to these cinnamon sugar crisps I made before, but much thinner. 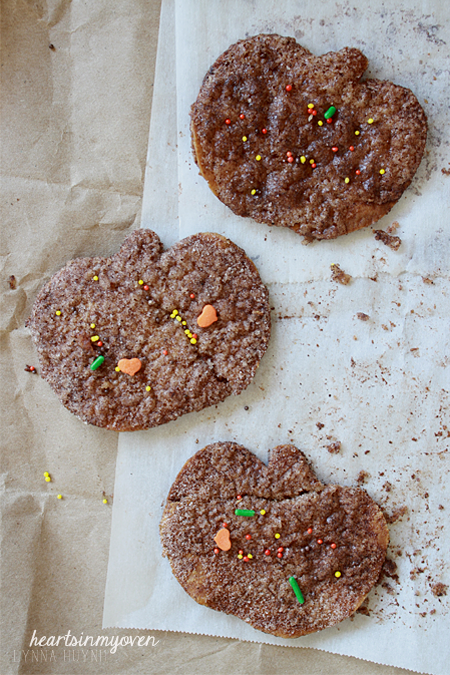 I sprinkled some Halloween jimmes/sprinkles to give these chips some festive flare. This recipe does require pumpkin pie spice. If you don`t have pumpkin pie spice, don`t fret! I made my own and shared the recipe with you last year, because it`s so easy and MUCH cheaper, especially if you have all the spices already. If you`re missing more than 3 spices and don`t think you`ll be using them for anything else, then purchase the pumpkin pie spice instead. This recipe is flexible though, so you can definitely just use a cinnamon sugar mixture instead! 2. Line your baking sheet with parchment paper. 3. In a small bowl, combine sugar, pumpkin pie spice, and cinnamon. 4. Using your cookie cutters, cut shapes from tortillas. 5. Using a pastry brush, brush melted butter on both sides of cut-outs. 6. Sprinkle both sides generously with sugar mixture. 7. Bake chips in oven for about 12 minutes, or until they are crisp. 8. If desired, add some holiday sprinkles.